I was lucky enough to receive a Kindle Touch as an early Christmas present. To be clear, I love it as a long-form reading device, from its weight to its battery life to its integration with Amazon’s ecosystem. It’s already begun to replace my next shelf of books. With that said, here’s my quick review of it so far, with a few ways Amazon could make it that much better. Most smartphones and tablets rely on capacitive sensors embedded directly in the display, but the Kindle Touch has infrared sensors set in the bezel. Whereas capacitive touch can distinguish skin from other forms of contact, these infrared sensors detect nearly anything as a touch event. The upside is that you can use the Kindle Touch while wearing gloves or with any pointy thing as a stylus. The downside is that other materials like the fabric of your sleeve can accidentally trigger it. These are more side effects though, of Amazon using infrared sensors to preserve the quality of the E Ink display. 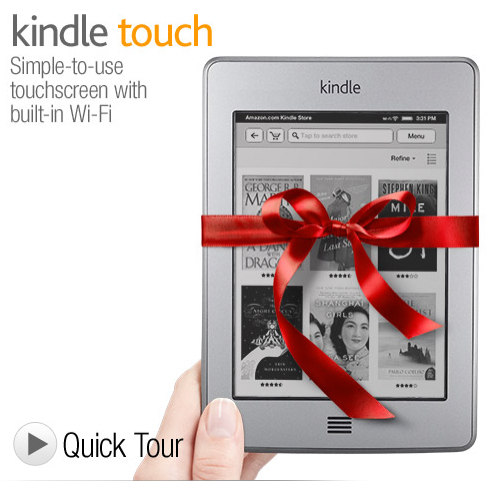 The Kindle Touch touts a range of multitouch gestures. Taps are used for page turning, item selection, and the soft keyboard. Swipes can also be used to turn pages, and to scroll elements that extend offscreen. 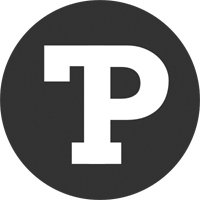 Pinch allows you to adjust text size and zoom into a webpage. In terms of recognizing these gestures as input, it’s fairly reliable and precise. One thing that has made iOS so successful is its use of direct manipulation — that is, fine-grained (essentially continuous) gesture input, mapped closely to the system’s feedback, which models some physical phenomenon. Apple was able to create the illusion of manipulating elements as if they were physical, and they accomplished it having iOS be extremely responsive to the user’s gestures. However, the Kindle’s E Ink display, you may be aware, is slow. Refresh rates measure in the hundreds of milliseconds, compared to 17 milliseconds for devices like the iPhone and iPad. So with the Kindle Touch, Amazon has wisely used multitouch gestures more to invoke discrete commands than for continuous direct manipulation. What this means is that a swipe, no matter how fast or far, moves the carousel of books three places; each pinch enlarges text by one size. The exception is the web browser, and there’s a reason that’s still experimental. My first thought upon opening the package was that the Kindle Touch is even smaller than I imagined. With each successive model, Amazon has shrunk the form factor down while keeping the 6-inch display intact. It’s gone from 8.0 × 5.3 inches in the first two generations, to 7.5 × 4.8 in the Kindle 3, to 6.8 × 4.7 in the Kindle Touch (Kindle 4 is smaller yet). While greater portability is nice, it’s past the point of diminishing returns. 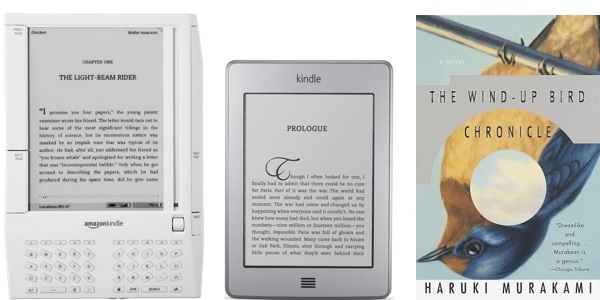 I’d like to see the next version of the Kindle Touch return to the original form factor – with display enlarged – making it roughly the size of a large paperback. Reading books would be made more comfortable, navigating the library and store even more so. Setup is dead simple, but afterwards I got stuck for longer than I care to admit on how to access my library. I eventually realized that what I had assumed to be a speaker was no speaker at all. A silly oversight on my part to be sure. But as bad as it is to make buttons non-obvious in software, it’s that much worse in hardware. TV makers, are you listening? I was disappointed to learn that the library can’t display book covers. I don’t know where I got that idea from. Oh, right. Amazon, please add this option for when we’re using your books, not just when you’re selling them to us. 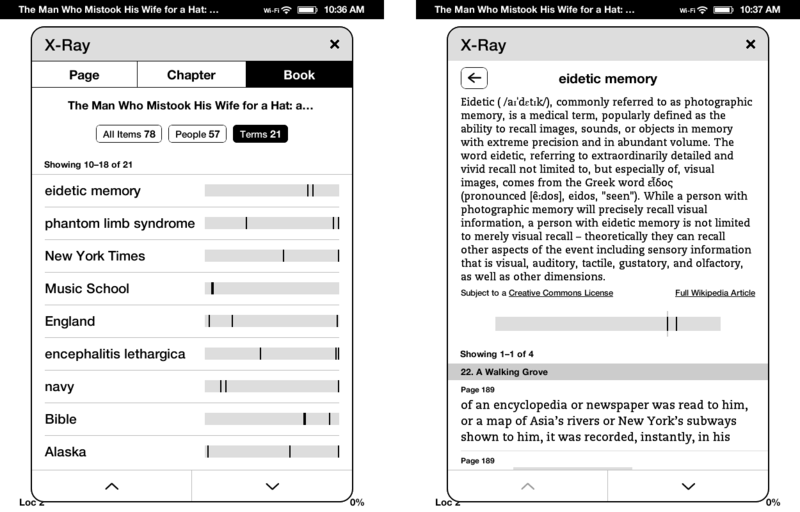 One of the value-added features the Kindle Touch offers is X-Ray. Amazon analyzes each book and presents key people, places, and things, background information on them, and where they show up in the book. Not all books support it yet, but Amazon doesn’t tell you which do and don’t. (As of this writing, The Man Who Mistook His Wife for a Hat does, Consider the Lobster does not). Under the “Text-to-Speech” bullet point seems as good a spot as any. Overall, I’m highly satisfied with the Kindle Touch. But if you’re in the market for an e-reader, the Kindle 4 is also worthy of consideration. Nice analysis. Btw that was your early B-day present. I thought it was a combo present really. They tricked you. The screenshot is of the Kindle Store, not the library on that Kindle. Does the kindle store have a cover display? The Kindle Store does have it. It’s an appealing and obvious feature, so I dangerously assumed the library would have it too.